Only in the EU, USA and Japan, around 6 million tones per year of scrap tyre are produced. The huge quantity of waste tires presently produced in the world will certainly increase in the future as the associated automotive industries grow. The disposal of scrap tires becomes a serious environmental problem. Traditional tyre disposing methods, such as burying in landfills or burning, can’t completely solve the problem of waste tires pollution. 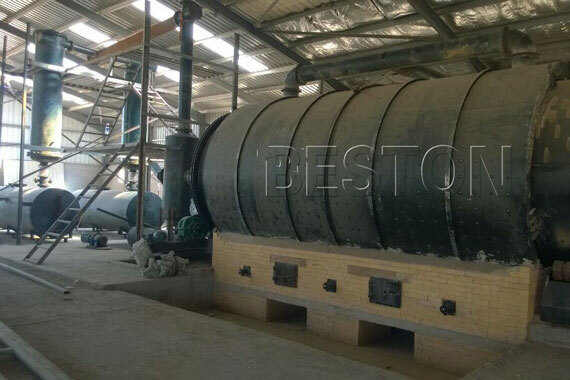 To dispose waste tires effectively and create more profits, our waste tyre pyrolysis plant project report can help you solve these problems very well. Pyrolysis is a thermochemical decomposition of organic material at elevated temperatures in the absence of oxygen (or any halogen). It involves the simultaneous change of chemical composition and physical phase, and is irreversible. The word is coined from the Greek-derived elements pyro “fire” and lysis “separating”. The pyrolysis method for recycling used tyre is a technique which heats whole or shredded tires in a reactor vessel containing an oxygen free atmosphere and a heat source. In the reactor the rubber is softened after which the rubber polymers continuously break down into smaller molecules. These smaller molecules eventually vaporize and exit from the reactor. These vapors can be burned directly to produce power or condensed into an oily type liquid, generally used as a fuel. Some molecules are too small to condense. They remain as a gas which can be burned as fuel. The minerals that were part of the tire, about 40% by weight, are removed as a solid. When performed well a tyre pyrolysis process is a very clean operation and has nearly no emissions or waste. 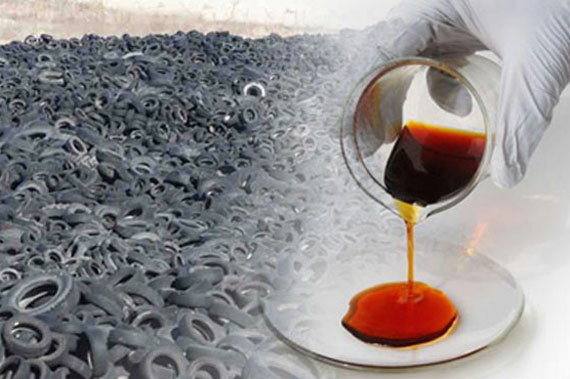 Pyrolysis of scrap or waste tyre can separate solids in the tire, such as steel and carbon black, from volatile liquid and gaseous compounds that can be used as fuel. Although the pyrolysis of waste tyre has been widely developed throughout the world, there are legislative, economic, and marketing obstacles to widespread adoption. The reactor uses Q245R boiler plate as material, and its thickness is 16mm. Moreover, the structure form is horizontal-type and 360-degree rotating, and the rotate speed of reactor can reach 0.4-0.8turn/minute. This special design makes the bottom of reactor get heated evenly, which lengthens the service life of reactor as well as improves the pyrolysis efficiency. Compared with general condensers, our tubular condenser has the features of larger cooling area and better cooling effect, which can greatly improve the oil yield. Besides, it is easy to maintain, which is very convenient for customers. 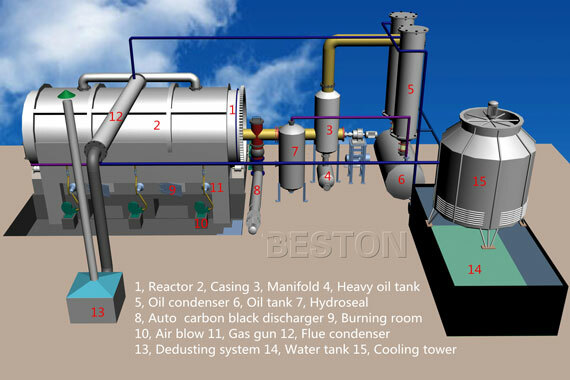 The plant is equipped with safety device (alarm for over temperature and pressure, auto pressure releasing system, extra gas recycling system, fire fighting devices) and advanced dedusting system (dust chemical removing tank, ceramic ring filtering system and alkali sprayers), which will guarantee safety and no pollution in production. Adopting auto discharging system, carbon black can be discharged automatically, which can save much manpower and cost for customers. This device is used to recycle the extra gas that can not be liquefied. By this device, the gas can be recycled to heat the reactor as fuel, which will save energy for the whole working process. At the same time, it can avoid the phenomenon of tempering. 1 Tyre oil 45% A. Sell directly. 3 Steel wire(for waste tyre) 15% A. Sell directly. 4 Flammable oil gas 10% A. Fuel burn by use gas burn system(pyrolysis machine included). Hydroseal and vacuum system will prevent exhaust gas from going back to condensers and reactor. Thus, unnecessary accident can be avoided. In addition, the plant is equipped with safety device (alarm for over temperature and pressure, auto pressure releasing system, extra gas recycling system, fire fighting devices), which can avoid danger in the production process and guarantee safety. In the system, three steps are used to dedust the hot smoke from reactor, more than 95% of the dust would be removed. The released gas is pollution-free and can be discharged in the air directly. In the process of pyrolysis, some combustible gas can not be converted into oil liquid in normal temperature and pressure, which could be recycled to the bottom of the reactor for reheating through the pipe of tail gas. In this way, it can avoid the gas contamination and save the fuel energy. Pyrolysis means 100% recycling of tires: All high valuable raw materials are extracted smoothly. 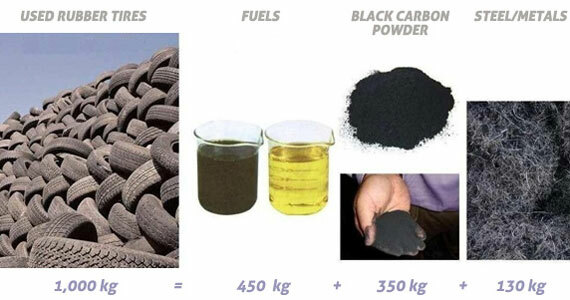 Tire Pyrolysis harvests 4 “Green“ products: Carbon Blacks (CB), Steel, Oil, and high caloric combustible Gas, which can be used for generating electrical engergy, heat, steam, or hydrogen. The international market price of quality virgin CB for rubber applications (made from oil) is approx 1.500 USD/t and a huge demand already exists (8 million ton p.a. worldwide). Rubber granules has limited demand and a market price of 100 to 200 USD/t and it is difficult to sell. Tire Pyrolysis delivers clean steel after processing and sells for regular scrap price approx 300 US$/t, steel from rubber shredding/grinding has still too much rubber attached what the profit let decrease. Tire Pyrolysis harvests Oil & Gas adding substantially higher revenue of approx 350 US$/t. 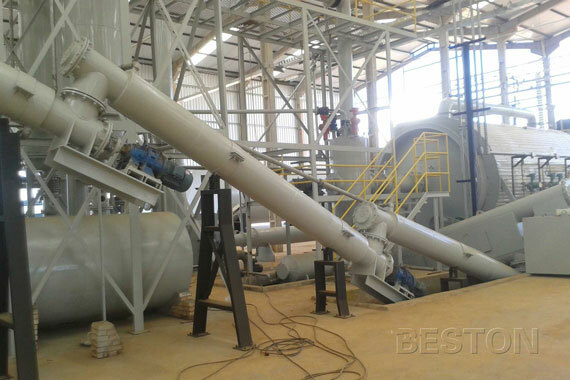 The tire pyrolysis processing plant need very minor maintenance in comparison with the heavy Shredding Machines who makes rubber granules. Costly knifes etc. to be renewed frequently. The world Oil prices will increase but recycled CB will have stable prices so it’s price advantage is even higher in the future. Same economic point applies to the recycled steel, oil and gas.